A Labyrinth will be set up in the sanctuary building during Holy Week. Come and experience the peace as you follow the weaving pattern to the center …. A Brief History There is evidence of labyrinth patterns in many ancient cultures. They are often linked with areas or artifacts having spiritual significance. 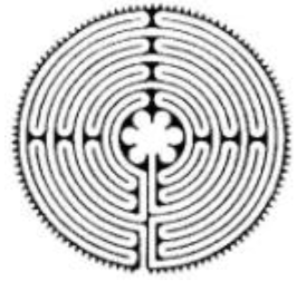 The labyrinth became meaningful for Christians in the twelfth century. Pilgrimages to Jerusalem became too dangerous during the Middle Ages and the Roman Catholic Church established “pilgrimage” cathedrals where symbolic journeys could be made by following a labyrinth, or circular path, on the floor of cathedrals.